O-HOHOHO, I am the great demon, the golden-furred nine tails! My my, aren’t you a nice looking master? It is still okay... to join my harem, no? My Love! Please receive it! Stay for the sumptuous feast, it will melt your body and heart. Heavenly Black Figure...... Well now, are you ready to serve me? Ohohohoho! Respect me! A beautiful Mistress, a beautiful victory suits me. Ahn...... annoying cat thieves......! Grrrr...! Oh my... Are you serious? You're really serious about me? That's fine~ LET'S PUNISHMENT! 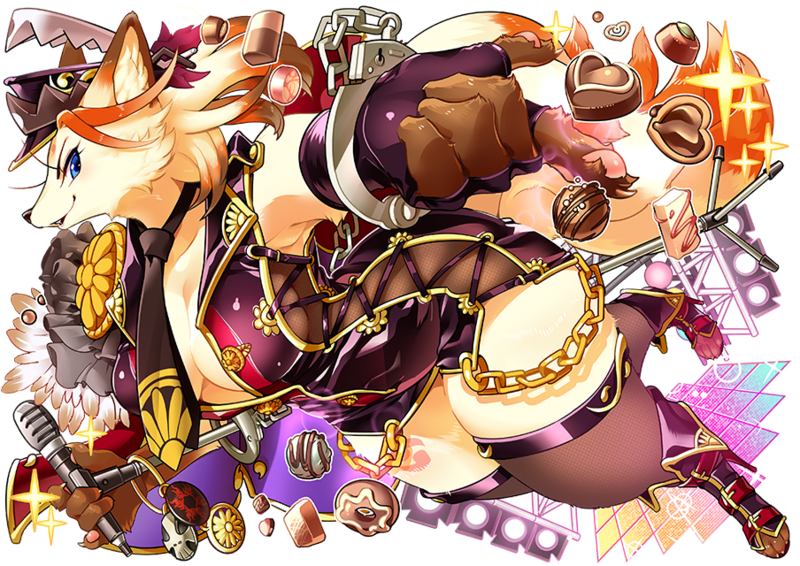 A beautiful nine-tailed fox Transient who is part of the Roppongi Tycoons guild and the owner of the incredible Tokyo Casino, an entertainment center located in Roppongi which hosts everything from gambling to beauty treatments. Recently, she's been fond of staging impromptu shows during peak hours by calling people she's interested in up onto the Tokyo Casino stage. In particular, she enjoys employing her Sacred Artifact, a cat o' nine tails Whip, to force them to make an oath of servitude to her. This is how she aims to achieve the ambition of building up a male harem filled with exactly the kind of guys she likes; those who worship only her. Inevitably she sees the very popular Idol Angel of the Aoyama Guild as her rival. A Summon with nine lovely tails and an executive of the Roppongi Tycoons. She is the owner of the Tokyo Casino, the entertainment establishment that combines gambling to aesthetics that is boasted of in Roppongi, City of the Chosen. Recently if someone pleases her, she likes to call them onto stage in the Tokyo Casino and then put on a show with all the public attention gathered. She loves to punish people with her Hallowed Artifact, a nine tailed whip, and make them swear obedience as her slaves. She carries a desire to gather the best slaves in Tokyo through this method to create a harem that will praise only her. So of course, with that personality she sees the highly popular idol angel of the Aoyama guild as an enemy. Her tail-come-Sacred Artifact has the ability to rouse the spirit and turn anyone she hits with it into a servant so loyal as to use up every last drop of energy for her sake. Her true worth is evident when she leads large armies. 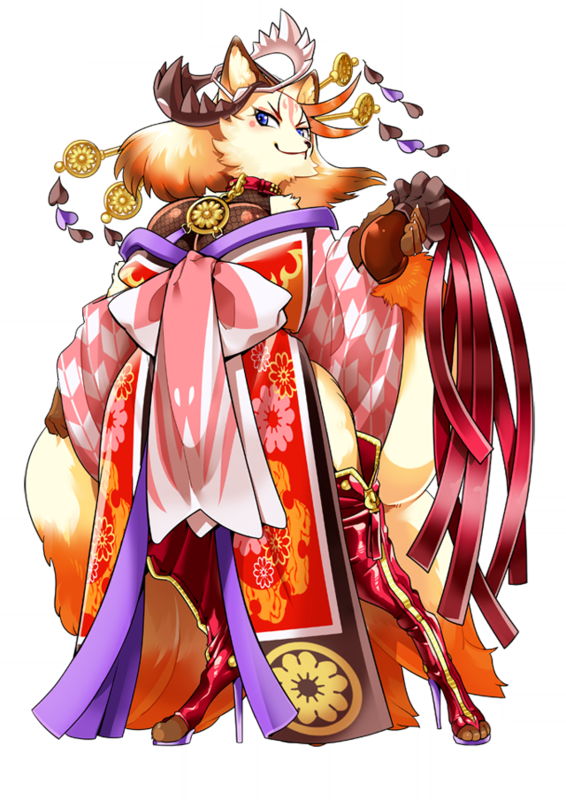 As a fox spirit, she is actually over 1000 years old, but any mention of her age or birthday is strictly taboo. Accustomed to the upkeep of her beautiful tails, she owns an upscale tail spa, through which she's built a relationship with a certain gladiator from the lkebukuro Berserkers. She also harbors a soft side, showering lavish praise upon those who perform music or sing beautifully. Her tail-transformed Hallowed Artifact has the power to encourage those struck hard by it, changing those people into slaves who will exhaust themselves to the last of their strength for her sake. Its true worth would shine best when commanding an army. As a kitsune who has lived for millennia, the topics of age and birthdays are taboo in her presence. She owns a beauty salon for tails that caters only to those with beautiful tails, and she is developing a friendship with a certain martial artist with the Ikebukuro Berserkers. There is another side to her that freely gives praise to those who perform in public singing and dancing. Incarnation of beauty, Super Beauty Hakumen. Beauty mode, let's put it in operation for you, master. Alright! Let's go, my master! My love, I will show it to you. Alright, please look, master! Beauty Mode, Maximum Liberalization! LOVE MAX! I'll devote everything to you! This is my strength, my love for you. Hmhmhm...... Master? I won't be defeated. An empress Summon who was brought to this Tokyo searching for her true as of yet unseen master. Her whip carries the flames of burning passion, and those hit by it may be laid bare mind and body. Her actions are rooted in love as ever, and even if they ever turn out to be mistaken they show a certain understanding and generosity. Her latest hobby is fashion. Now as someone who is managing Valentine's Day she has wrapped herself up in warden's clothes, but she is rather into it. In regards to Ophion as one of the top four who attend Roppongi Academy, she holds an extraordinary level of hostility to him, though this is similar to disgust for someone who is similar to her. The White-Faced Golden-Furred Nine-Tailed Fox (白面金毛九尾の狐, Hakumen Konmou Kyuubi no Kitsune), is a fox spirit in Japanese mythology that possesses various women connected to rulers, causing discord in their region. 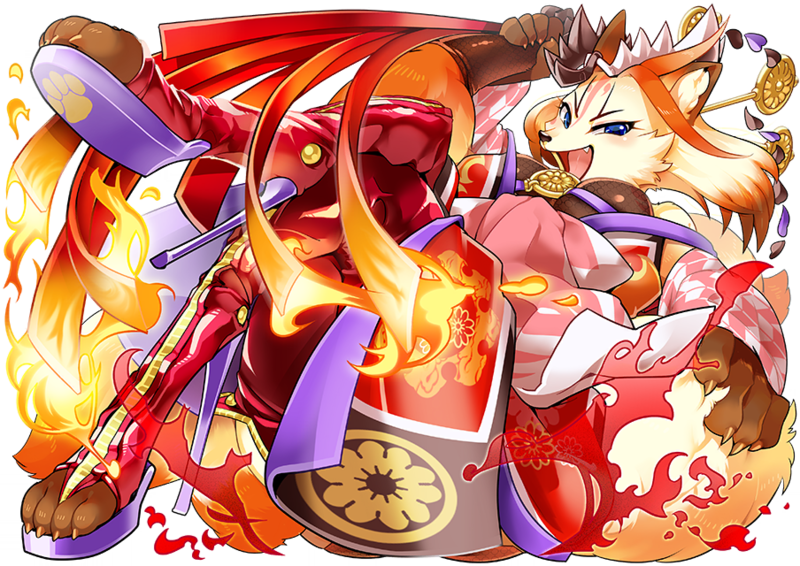 Her charge skill, Keisei Sangoku, is a reference to the three concubines Tamamo-no-Mae of Japan, Daji of China and Lady Kayou of India, who corrupted the rulers of said countries. Literally the worst. I can't stand that voice.